Currently approved treatments provide only symptomatic relief or delay symptoms of Alzheimer’s disease (AD) and Parkinson’s disease (PD) at best. The tremendous unmet medical need demands effective disease modifying therapy combined with a diagnostic biomarker for the early detection of “preclinical or asymptomatic” stages of disease, thereby enabling a halting of disease or reversal of progression. In AD, in particular, the unmet medical need is to identify new therapeutics that can be introduced early in disease progression to alter pathogenesis. This can only be achieved with the availability of robust diagnostic methods to detect changes in the brain at their very inception, in advance of significant neuronal loss or as soon as possible thereafter. A key challenge to resolving this unmet need is the identification of an early stage biomarker that is already abnormal prior to the onset of pronounced clinical symptoms. In PD, the unmet medical need is to identify new disease-modifying neuroprotective therapeutics that can be introduced early in disease progression to alter striatal dopamine neuron loss progression and to avoid later stage motor and non-motor complications. Viable drug candidates require a putative mechanism of action known to be implicated in the pathogenesis of PD including, oxidative stress, mitochondrial dysfunction, excitotoxicity and inflammation. Inhibiting the production of amyloid plaques and Tau based tangle formation is the scientific rationale for Aestas development programs. Aestas Pharma’s proprietary technology platform was established from an invention exclusively licensed from NIH (US issued patent US 8,597,660 B2). The company’s proprietary therapeutic candidate (AP-121) is a small, highly specific inhibitory peptide fragment that passes through the blood-brain barrier and significantly reduces activation of disease-specific aberrant cyclin dependent kinase 5 (abt_Cdk5) activity, reversing memory/motor deficits and rescuing Alzheimer’s disease (AD) and Parkinson’s disease (PD) pathologies.The company’s proprietary aberrant Cdk5 PET imaging agent (AP-251) candidate is a PET tracer with the capability to detect AD pathology before significant amyloid plaque and neurofibrillary tangle build-up, or neuronal loss is detectable. BACKGROUND: During neurotoxic stress, intracellular rise in Ca (2+) activates calpain, which cleaves neuronal p35 (normal Cdk5 activator) to generate p25 which becomes a potent and mislocalized hyper activator of Cdk5, resulting in abt_Cdk5. Notably, in recent years the elevated presence of Cdk5 and p25 proteins in disease-implicated abnormal protein aggregates (plaques/tangles, and Lewy bodies) has been demonstrated in the brains of patients with AD and PD. Overexpression of p25 in a transgenic mouse model results in the formation of plaques, p-tau, tangles, neurodegeneration, and cognitive deficits that are pathological hallmarks of AD/PD. Mechanistically, abt_Cdk5 activity is known to regulate multiple upstream molecular pathways (amyloid, tau, mitochondrial / autophagy dysfunction, oxidative stress, and the neuro-inflammatory cascade) implicated in the pathogenesis of both AD and PD. At the scientific level, there is considerable evidence validating aberrant CDK5 (abt_Cdk5) activity as an attractive pharmacological target as its deregulation is implicated in various neurodegenerative diseases such as Alzheimer’s and Parkinson’s diseases. The abt_Cdk5 technology specifically targeting disease implicated abt_Cdk5 activity offers a compelling scientific rationale and unique opportunity for the development of novel diagnostic imaging agents to enable the early detection of disease pathology before significant amyloid plaque build-up or neuronal loss is detectable and also paves the way for the development of therapeutics for the reversal of severely debilitating neurodegenerative diseases. The formation of Cdk5-p25 (abt_Cdk5 complex) is considered an “upstream” event in the development of the three best-known pathways for AD (Tau, amyloid, and the neuroinflammatory cascade). The long half-life of the abt_Cdk5 complex results in a hyperactive, aberrant Cdk5 that hyperphosphorylates Tau, neurofilament, amyloid precursor protein, glycogen synthase kinase 3beta, and cytoskeletal proteins that are hallmarks of neurodegenerative diseases including AD and PD. Furthermore, abt_Cdk5 indirectly regulates the kinases and phosphatases that act on Tau. The abt_Cdk5 complex is also observed in most neurodegenerative or neuronal disorders such as AD, PD, Amyotrophic Lateral Sclerosis, stroke, and neuropathic pain. Furthermore, accumulation of the abt_Cdk5 complex components are found in the brains of Alzheimer’s and Parkinson’s disease patients. The scientific rationale for the possible use of an early stage AD pathology indicating biomarker is compelling based on published studies using preclinical AD rodent models which demonstrated a significant correlation between increasing abt_Cdk5 complex/activity, and the increasing presence of disease implicated amyloid plaques, p-Tau/NFT, and neuroinflammation. Therefore abt_Cdk5 offers an attractive candidate for development as an early stage AD pathology biomarker, as a surrogate endpoint biomarker and as a target for disease-modifying therapeutics. (1) ALZHEIMER’S DISEASE: Preclinical studies using validated AD models have established the successful inhibition of abt_CdK5 activity by AP-PEP31. In addition, administration of the AP-PEP31 peptide can significantly ameliorate AD pathology (up to 80%), reduce amyloid plaques, reduce NFT’s/p-Tau, reduce neuro-inflammation and apoptosis, rescue behavioral deficits (up to 80%) including spatial working memory and motor function, rescue neuronal loss, and increase longevity in mice (by the human equivalent of more than 5 years). (Shukla et al., 2013). AP-PEP31 has also been shown to rescue high glucose-mediated neurotoxicity, an important emerging link between neuropathology seen in AD and diabetes (Binukumar BK et al, ‎2014). (2) PARKINSON’S DISEASE: In validated preclinical models of PD, the AP-PEP31 peptide has been shown to inhibit abt_Cdk5 activity, completely reverse nigrostriatal dopaminergic neurodegeneration, increase levels of dopamine (up to 90%), and reduce its metabolite depletion (up to 90%). Further, AP-PEP31 peptide administration reduced neuro-inflammation and apoptosis, and significantly improved gait dysfunction. Importantly, these effects observed in both AD and PD models are achieved without evidence of toxicity (Binukumar et al, ‎2015: Binukumar & Pant, ‎2016). Collectively, the aforementioned studies revealed a strong link between disease-implicated abt_Cdk5 and potential treatment outcomes, or clinical benefits in both AD and PD preclinical models. Further, these studies also demonstrated target specificity of aberrant Cdk5 inhibitorsin in vivo studiesby an immunohistochemical method of visualization. Exclusively licensed from NIH, the current patent estate (issued patent US 8,597,660 B2) covers isolated TFP5 peptides (Aestas investigational peptide), methods of modulating CDK5 activity at therapeutic doses, pharmaceutical compositions and methods for use of such for treating subjects with a neurodegenerative disease, such as Alzheimer’s disease (AD), amyotrophic lateral sclerosis (ALS) and Parkinson’s disease (PD). 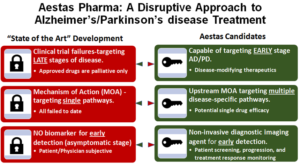 DIAGNOSTIC DEVELOPMENT: Aestas Pharma has an exclusive license to develop a TFP5 imaging agent with a worldwide scope, and a granted field of use spanning all diagnostic applications including, but not limited to: Alzheimer’s disease, Dementia, Taupathies, Parkinson’s disease, and Amyotrophic Lateral Sclerosis. Aestas also has an exclusive license to develop small molecule mimics of an aberrant Cdk5 inhibitor (TFP5 peptide)in regard to all diagnostic applications. THERAPEUTIC DEVELOPMENT: Aestas Pharma’s exclusive license to develop a therapeutic is exclusive with a worldwide scope, and a granted field of use spanning the following: Alzheimer’s disease (intranasal delivery), Parkinson’s disease, neuropathy, neuropathic pain, peripheral neuropathy, diabetic neuropathy, neurapraxia, axonotmesis and neurotmesis therapeutics. Aestas also has an exclusive license to develop small molecule mimics of an aberrant Cdk5 inhibitor (TFP5 peptide) in regard to all therapeutic applications. Biomarkers of Parkinson’s disease: present and future. ALZFORUM Blog – Aberrant Cdk5 regulates neuroinflammation and triggers neurodegeneration.